Our French Creme is a very light off-white/ivory color while the Desert Sand and Mocha Tan colors are different shades of tan. Oiled Bronze is a dark brown color. We also offer Metallic Silver, which is a gray/silver color that matches well with aluminum trimmed doors (as are often found on sliding glass doors) as an optional bottom rail color. We offer this choice for exclusively for the bottom rail color because it matches nicely with our optional aluminum threshold adapters as well as many standard residential thresholds. 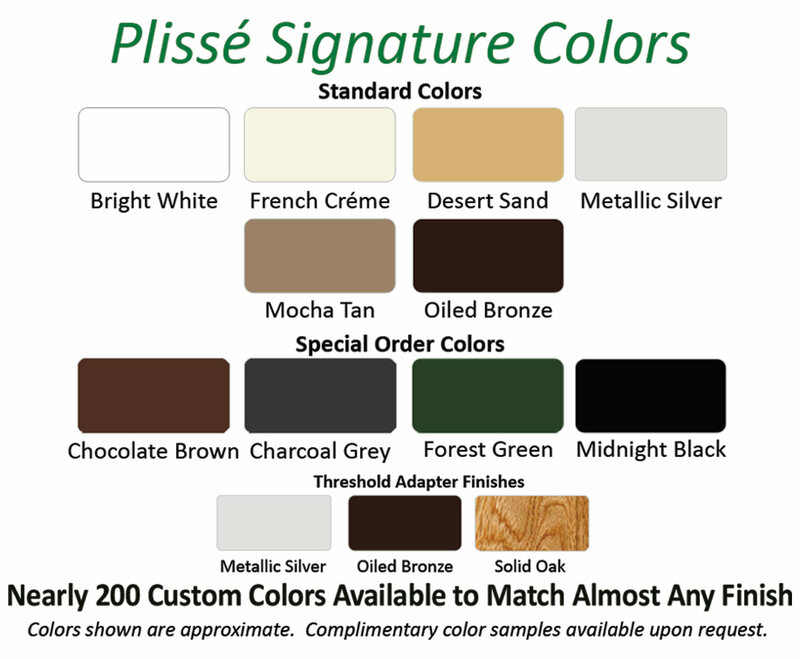 Above is a chart of our Plisse Signature Colors, please note that this chart is an approximation of the colors and not an exact color match. 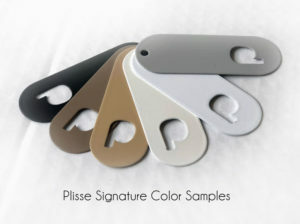 If you are unsure of the right color for your Plissé retractable screen please feel free to email us at sales@plissescreen.com with a picture of your doorway or trim, or order complimentary color samples here. If you’re looking for something more than what we have to offer in our six standard color options but aren’t interested in the investment of a custom color than our special order colors may be a good compromise for you. 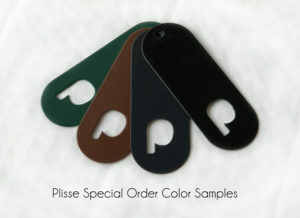 For only $25 per unit (a single is 1 unit, a double is 2) we can have your Plisse retractable door or window screen powder coated in these 4 additional colors: Chocolate Brown, Charcoal Grey, Forest Green and Midnight Black. Simply choose the color of your choice under the color selections when ordering your Plisse invisible screen here. Screen Solutions Inc does offer custom color matching for customers who need the frame of their Plissé retractable screens to exactly match their door or window trim. The price for this service varies depending on how specialized the color is in powder coat. If our powder house stocks your color than the additional charge per unit is only $100. The production time on a stock powder is extended two weeks beyond our usual two week production time. If our powder house does not stock your color than we will send your color sample to our powder dealer who may have the color in stock. If they stock your color than the additional cost is $275 per unit and the production time is extended four weeks beyond our usual two weeks. If our powder dealer also does not stock your color than it will have to be special ordered by the dealer and the additional cost is $475 per unit and the production time is extended ten weeks beyond our usual two weeks. As with anything, higher quantities mean lower prices so if you have several openings you are wanting color matching for the above may not be cost prohibitive. We are always happy to answer any questions regarding color matching and our Plissé retractable screens. Please feel free to mail us a sample of your color at Screen Solutions Inc, Attn: Color Sample, 6705 Hwy 290 W., #502 Austin, TX 78735. Please include your full contact information as well as the sizes and quantities of Plissé retractable screens you are interested in. Serious inquiries only please as this is a time consuming service we offer to free of charge.